Pirates manager, Clint Hurdle, commented, “Jordy’s walk with the Lord is special and significant. He is a man of action and very intentional. Jordy received a scholarship to play baseball at Oklahoma State University at Stillwater which is in the Big 12 Conference. He claims it was some of the “best three years of his life.” College helped him grow to be a professional baseball player. He went to OSU to up his game. Mercer was a shortstop and a pitcher as the role of a closer. When he left, he held the OSU record for saves. However, it was his “glove and stick” that got him on the Big 12 All-Star team in 2006 and 2008. “I got some Big 12 honors, but I am more of a ‘team first’ guy. I would not be where I am today if not for my teammates.” Mercer competed for the United States in the 2007 and 2011 Pan American games, winning silver in both. He also competed in the 2011 Baseball World Cup. 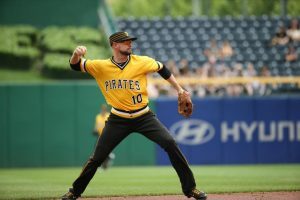 The Pittsburgh Pirates drafted Mercer in the third round (79th overall) in the 2008 major league draft as a shortstop. Mercer was brought up to the parent club on May 29, 2012, and made his first major league appearance May 30, 2012, getting his first major league hit the same day. He has been a regular on the roster since 2014. Soon, Jordy and Kasey began hanging out together that later led to dating. They made it official when they started wedding plans. They were married January 16, 2010, in Edmond, Oklahoma, and they are now parents of three boys, Maverick (6), Maddon (3), and Manning (1). “I have been super blessed, and she is the glue that keeps the family together.” Jordy was an education major and Kasey received a degree in apparel merchandise. Jordy’s most important mission field to witness to is his family. “I always send my wife the daily quote or Bible verse of the day. We are more involved with our kids and lead them to Christ as early as possible. Jordy’s most important mission field to witness to is his family. “I always send my wife the daily quote or Bible verse of the day. We are more involved with our kids and lead them to Christ as early as possible. We want them growing up knowing their home is a ‘Christ centered’ household. We pray with them, read Bible stories and take them to church and its programs. As a dad, you can’t wait to share Christ with them.” The Mercers make their off-season home in Edmond, Oklahoma, and they attend Crossings Church in Oklahoma City with Pastor Marty Grubbs. Kasey grew up in this church, and Jordy and Kasey and the kids love it there with the many programs for the kids and Bible studies for them. The most recent public witness he participated in happened at the Pirates’ Faith Night after a game at PNC Park. Clint Hurdle was a key person who helped start Faith Night in Pittsburgh. “It was our fifth year to have Faith Night at PNC Park, and the crowds have grown every year. This year Josh Harrison and I shared our faith journey with the fans. It was an opportunity for me to use baseball as a platform and reach out.” Jordy also uses social media to share Scripture and quotes to help those who might be having a bad day or need uplifting. Love whaty ou wrote about his being an intentional man, an that’s a lesson I can take to heart. Next post: Is Our Gender Biological Or A Choice?